This is a fun, light-hearted interview with the Inti Creates staff behind Mega Man 9. After introductory remarks by Keiji Inafune and Rie Onishi, the staff banters about character design and capturing the “Famicom” quality. This interview was originally included in the Rockman 9 Arrange Soundtrack liner notes. I hadn’t designed a robot master in a long time, but for MM9 I designed two: Plug Man and Splash Woman. For Plug Man, if I had to say, I aimed to make a robot master who was standard in all regards, something that would be a good basic model for the younger staff. The previous robot masters would be good models too, but I think if I let them just design whatever they wanted as normal, there’d be a tendency to create designs that are too elaborate and overdone. Naturally this would lead to robot masters that don’t have that “Mega Man” feel. To avoid that outcome, I made Plug Man very simple! It was like I was saying “please study this!” to the staff: he’s got a really obvious plug, a small color palette, and a simple, uncomplicated head. With Splash Woman, the design team first came up with the idea for a female robot master, and they said they wanted me to design her. At first I thought, what, are you guys trying to set me up for failure with something impossible like this?! Well, I’ll show them! I thought, and started brainstorming ideas. Originally I thought to make Hornet Man the female master, but I thought a mermaid would suit a water stage and changed it. For her head (the robot master’s heads always give me trouble) I gave her a bob haircut. She was the Mega Man series’ first female character, but she was very fun to design. On the Famicom you were always struggling with the color palette limitations, and you could only freely color two objects at a time. When I think about the challenges the Famicom Mega Man developers faced, working without the modern software tools we have today, I think they really must have been supermen! For graphic design in Mega Man 9, our priority was to make sure everything was visually easy to understand. We made sure all the enemy bullets weren’t obscured by the colors in the stage. That took us a little beyond the limitations of the original Famicom, but I think our designs still retained the overall spirit of the system. Be sure to let Mega Man stand still once in awhile so you can get a good look at all the enemies! Ippo Yamada (Sound Designer): So, let’s start off by talking about the Rockman Antique minigame in Mega Man ZXA, which was the start of this whole grand MM9 adventure. Shinichi Sema (Programmer): When we were making ZXA, we didn’t have the faintest idea that we’d one day be working on Mega Man 9. Actually, Mega Man 9 wasn’t originally going to be released on the Wii; we were going to develop it using the Wii development environment and tools, and then finish it and release it for the DS. Gen Kamada (Programmer): Yeah, that’s right. And later we talked about releasing it on the DS in addition to the Wii, too. A screenshot from Rockman Antique. Sema: Unfortunately the DS (256×192) screen size is smaller than the Famicom (256×240) screen size, so it wouldn’t fit. It just wasn’t really possible. Yoshihisa Tsuda (Supervisor, Mega Man PhD): I think there’s still a lot of people who’d like to play MM9 on the DS. Ken Murakami (Programmer): Should you really be saying that here…? Hidetoshi Minamoto (Background Designer): If we’re going to port it, how about the actual Famicom?! Rie Onishi (Designer): Yeah! I like that idea. Yamada: For MM9, Capcom sent us the basic outline for the plot and design, which formed the stylistic foundation for the project. But I do remember that until the design plans were finalized, the game design through two or three major revisions. Onishi: That’s right. Taking the bosses as an example, this was the first Mega Man to have a female robot master, but in our initial designs she was a bee girl. Tsuda: Yeah. But she looked like something out of a cosplay, so we axed that. Not that there’s anything wrong with cosplay! Onishi: The bee woman idea unfortunately didn’t pan out, so we decided to try a mermaid motif! And so Splash Woman was born. In exchange, the male counterpart “Ocean Man” we had made was then abandoned. Onishi: Speaking of women, if you buy Roll a new outfit then she’ll be shown wearing it in one of the ending illustrations. Tsuda: You can buy Roll cute clothes! I’m gonna buy it all for her!! Minamoto: Everyone on the team is in love with Roll. No one cares about Mega Man. 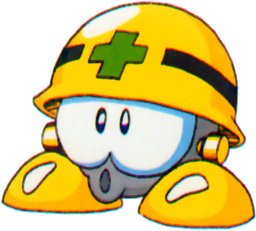 Onishi: When you take Mega Man’s helmet off and he’s got black hair, he suddenly looks really normal. He looks funny just standing there motionless and blinking. Minamoto: Yeah, because the Met helmet is invincible. Yamada: By the way, what happened to Forte? Weren’t there plans to make him a playable character? Tsuda: Ah, Forte… during testing we decided to postpone our plans of adding him. Sema: Here’s a hint: the ending! Murakami: A hint?! You just gave it away!! Tsuda: Forte may be retired, but you can play as Protoman. I really want players to try him out! Murakami: With Rush, Eddy, and Beat all making appearances, it’s like an ensemble cast of all the characters from past games. Sema: Even Auto is there for the first time in 8-bit. Murakami: He appears in cut-scenes too. Sema: Yeah, we have a lot of cut-scenes this time. Famicom games would usually only have a few. Yamada: Minamoto, tell us about the backgrounds. Minamoto: The backgrounds I made in the early stages of the development are very different from their final versions. The early versions were more elaborately detailed. But since our concept for MM9 was “Famicom!”, I thought simpler backgrounds would be better. Minamoto: Yeah, it had more of an amusement park feel than was called for in the design document, and they requested I give it a more plant/nature look. I removed the pink and changed things to the green coloring you see today. Onishi: The petal midboss with the flower clock motif was added to match the new mood of the background. We also added the potted plant enemies. It turned out to be a stage resplendent with natural beauty. Yamada: Given the “A new Famicom game? !” theme of MM9, I think the whole team really spent a lot of time figuring out how to evoke that Famicom-ness. Murakami: For the sound, we replicated the Famicom’s limitation on the number of sounds that could be simultaneously reproduced. Famicom games would often have some part of the music cut out when a sound effect was played. That doesn’t happen on recent hardware. We had to program routines that deliberately cut out sounds. It was a real pain to create. Day after day I would make adjustments until it finally approached that Famicom quality. Sema: In pursuit of my research into “Famicom-ness”, I went to an electronics shop and bought a bunch of different things. Of course I picked up Mega Man 1 through 6. Onishi: Even though the Playstation port was much easier to get, you went the extra mile and searched for the actual Famicom carts… you overachiever! Tsuda: You know, if you’d asked me, I could have just lent you my copies. I’ve even got Mega Man Soccer and Rockboard! Sema: Nah, I wanted them for my personal collection anyway, so it was a good opportunity. Pixel art mock-ups for the concept art robot masters, by hfbn. Sema: Replicating the original Famicom graphics was very difficult too, wasn’t it? Tsuda: Speaking of the graphics, the Famicom also had screen flicker if there were too many objects on screen at the same time. Sema: Yeah. That too was an essential element of Famicom-ness. Kamada: If we didn’t take the time to accurately reproduce those things, it wouldn’t have felt like a Famicom game. Onishi: That reminds me, I heard that we originally were going to do a password system just like the old Famicom games. Why didn’t that work out? Sema: With the Challenges and such, there was too much information that needed to be saved for a password system. Tsuda: Dry your tears, young lass! Next time we’ll make a save system with 100-character passwords just for you! Sema: I just had a vision of some poor soul holding his head in his hands after realizing he made a mistake recording the password! Yamada: There were many languages needed for the overseas localization. Together with the debugging and mastering work, it was definitely a difficult project. Minamoto: I didn’t get any Obon vacation time! Yamada: Well, thankfully, that’s all over now. Is there any final message you’d like to convey to everyone? Kamada: MM9 is available for download purchase now, so you don’t even have to leave your house! You can just roll out of bed and buy it! Murakami: The special weapons are all totally unique! There’s infinite ways to clear the stages! Minamoto: The rankings are worldwide. We at Inti Creates look forward to being surprised at your time attack scores! Onishi: When I first played, it was hard for me too. I kept dying over and over. But I eventually cleared the game, so don’t give up boys and girls! Sema: I hope Mega Man 9 is enjoyed not only by adults who played the previous games, but by children today who are new to the series. Tsuda: Mega Man 9 is like dried squid: the more you chew on it, the more flavor you get. Please enjoy savoring the flavors of Mega Man 9. Yamada: Oh, and by the way, our fastest clear time at Inti was 28 minutes, by D.K.! Let’s Challenge! There’s an editor’s note here that points out that Tsuda was responsible for Mega Man wearing a Met helmet in MM7.